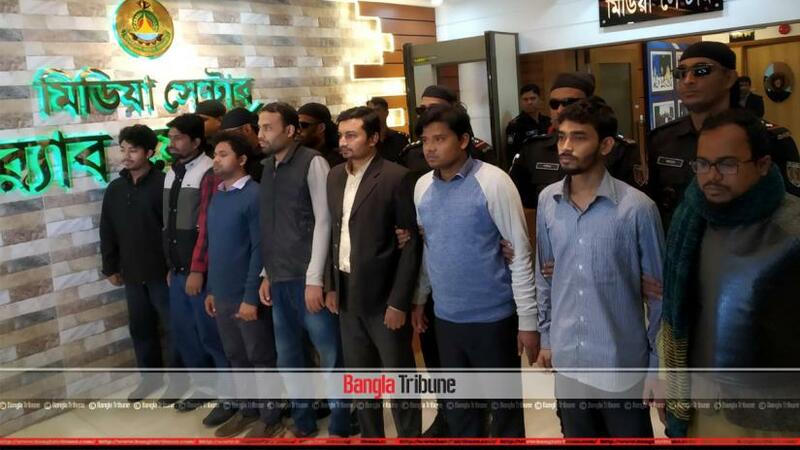 The eight men held on charges of spreading rumours are members of banned political party Jamaat-e-Islami’s student front Shibir, said Rapid Action Battalion (RAB). They hired studios to produce video contents, parody songs and shared those in social media including Facebook and YouTube, RAB briefed the media on Saturday (Dec 29). Earlier on Friday night RAB arrested eight men, who the elite force have identified as Shibir activists. The arrestees are – Mahmudur Hasan, 27, Abdullah Al Noman, 26, A Kader, 28, Morshedul Islam, 22, Saiful Islam Mithu, 29, Didarul Islam, 35, Arifur Rahman, 34, and Motahar Hossain, 21. “A group financed them with Tk 4.7million to create fabricated contents centring the polls,” said RAB’s media wing commander Mufti Mahmud Khan and added that the financing group is yet to be traced. The detained men revealed to RAB during initial questioning that they were tasked with a project of creating at least 150 websites and spreading fake contents over the Dec 30 election. RAB has so far detained 35 people for their involvement in spreading rumour over the election.